Between the years of 1984 and 1986, archaeologists excavated the landscape at the Melanson Settlement and findings of the archeological digs, four structures built before 1755 were discovered. Fascinating artifacts were found during these digs and the signs overlooking the landscape explain the history and findings. Most of the artifacts which were found, analyzed and studied have been put on display at the Fort Anne National Historic Site. As visitors arrive at the Melanson Settlement, there are welcoming signs and a trail that takes about 20 minutes to walk and read all the interpretative signs. There are areas where the scenery is beautiful overlooking the uplands which is where the Melanson's built their home when the community first started in 1664. Up until the deportation, there were 4 generations of the Melanson family residing here, a number which never got any bigger than about 10 to 12 households. 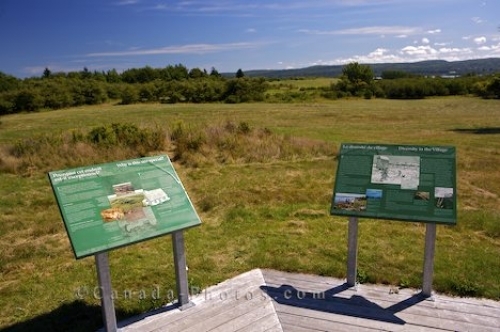 This is the landscape where the archaeological digs were done and today, the signs explain everything about this National Historic Site in Nova Scotia, Canada. Picture of the signs explaining the archeological digs at the Melanson Settlement National Historic Site in Nova Scotia. Site of archeological digs - the Melanson Settlement National Historic Site, Port Royal, near Annapolis Royal, Bay of Fundy, Evangeline Trail, Nova Scotia, Canada.